Elcor are a Race in Mass Effect Andromeda. This page will cover the characteristics of this race. The elcor are a Citadel species native to the high-gravity world Dekuuna. They are massive creatures, standing on four muscular legs for increased stability. Elcor move slowly, an evolved response to an environment where a fall can be lethal. This has colored their psychology, making them deliberate and conservative. Elcor evolved on a high-gravity world, making them slow, but incredibly strong. Their large, heavy bodies are incapable of moving quickly, but they possess a rather imposing stature and immense strength, as well as thick, tough skin. They move using all four limbs to support and balance their massive bodies. Given their method of communication, they likely have highly-attuned olfactory senses. 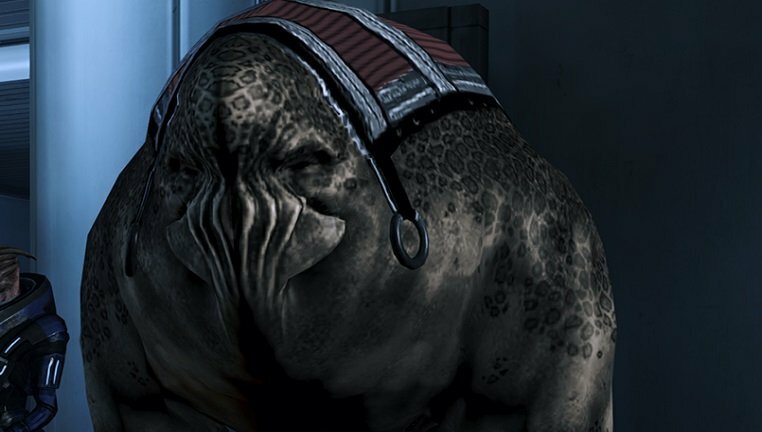 Elcor "lips" are multiple vertical slats situated in what is normally the location of the mouth in other races. Despite the peculiar arrangement, these "lips" are capable of holding on to protruding objects like cigars with no effort. Elcor speech is heard by most species as a flat, ponderous monotone. Among themselves, scent, extremely slight body movements, and subvocalized infrasound convey shades of meaning that make a human smile seem as subtle as a fireworks display. Since their subtlety can lead to misunderstandings with other species, the elcor prefix all their dialog with non-elcor with an emotive statement to clarify their tone.